Apple now offers the option to upgrade the 15-inch and 17-inch MacBook Pro portables with a 2.6 GHz Core 2 Duo processor (+$250) and 250 GB Serial ATA Drive (+ $150). "Data recovery company Retrodata has challenged Apple to come clean about what it claims is a 'critical manufacturing flaw' affecting some hard drives used in MacBook laptops and desktops like the Mac Mini - an issue that could result in data loss. "According to Retrodata, its customers have sent in a much higher number of failed Seagate 2.5in SATA drives made in China and loaded with firmware version 7.01 than of any other current hard drive model. "'We're getting 20-30 times more failed drives of this kind than others,' Retrodata chief Duncan Clarke told Register Hardware." "Some of the failures are attributable - indirectly - to Mac OS X's Safe Sleep feature. This copies the contents of a laptop's memory to the hard drive whenever the computer is put to sleep." "Mac users can disable Safe Sleep...."
"Taiwan's Asustek Computer complained on Tuesday of a shortage of Intel central processing units (CPUs) for laptops, but said it didn't expect the problem to affect its sales. "'The biggest shortage in notebook components is in CPUs, Intel CPUs. Intel isn't meeting demand,' said Jerry Shen, president of Asustek, answering questions at an investors conference in Beitou, Taiwan. "As well as manufacturing its own brand of computers in the Far East, Asustek also manufactures devices for other brands, including (according to some reports), Apple. An Intel chip shortage is unlikely to only be affecting one vendor." "Want a new notebook this Christmas? Then get your order in early. That's the message coming out of Taiwan, source of almost all of the world's laptops, from the big brands to the little-known names. "Intel has apparently told notebook manufacturers that the supply of its products will become a lot less tight by the end of the year." Link: World to Face Laptop Famine This Xmas? "The $100 laptop, designed to save the children of developing countries from a world without technology, might have to be rebranded. The machine's price tag has now hit the $200 mark. "Anyone feeling altruistic can purchase the machines in lots of 10,000 and say where they'd like them to be sent. Smaller donations can also be made, but for a higher cost of up to $299 per laptop. The extra cash will fund yet more laptops to be sent to the place OLPC deems neediest. "But according to the One Laptop Per Child organisation, although the initial hope was that the machines could be built for $100 apiece, the build cost is now up to at least $175 or, according to Reuters, $188"
PR: The One Laptop per Child (OLPC) Association, Inc., a nonprofit organization focused on providing educational tools to help children in developing countries "learn learning," announced today that LATU, the Laboratio Tecnológico del Uruguay (Technology Laboratory of Uruguay) has awarded OLPC a contract for the purchase of the first 100,000 XO laptop computers for a project including up to 400,000 units. Brightstar Corp., OLPC's exclusive global sales and distribution partner, was instrumental in helping OLPC win the competitive bid. The CEIBAL Project will deliver the laptops to all schoolchildren and all teachers in public schools in Uruguay during 2007-2009. The project will also provide connectivity to schools, town buildings, and homes. The project has had a very successful school pilot with XO laptops in Villa Cardal, Uruguay. "We are very much looking forward to the next phase of the CEIBAL Project and to bringing highly innovative education and an equal access tool to all school children in Uruguay," said Miguel Brechner, President of LATU. "The XO laptop's advanced features and functionality - including the out-of-the box mesh network, integrated camera and dual-mode display - are certain to delight the children of Uruguay and to kindle in them a deep passion for learning, creativity and self-expression." "We're delighted that Uruguay has fully committed to the OLPC program," said Nicholas Negroponte, founder and chairman of One Laptop per Child. "We commend Uruguay for the being first country to take concrete actions to provide laptops to all its children and teachers and look forward to other countries following this example and using their due diligence to evaluate the opportunity." One Laptop per Child is a nonprofit organization created by Nicholas Negroponte and others from the MIT Media Lab to design, manufacture and distribute laptop computers that are sufficiently inexpensive to provide every child in the world access to knowledge and modern forms of education. These XO laptops will be rugged, open source, and so energy efficient that they can be powered by a child manually. Mesh networking will give many machines Internet access from one connection. The pricing goal is $100. The XO laptops will be sold to governments and issued to children by schools on a basis of one laptop per child. Starting November 12 and for two weeks only, individuals in the US and Canada will be able to participate in the Give 1 Get 1 program and for US$399 get a laptop while giving one simultaneously to a child in a developing nation. PR: WD Scorpio 2.5" drives offer high-performance, low power consumption and cool operation, making them ideal for notebooks and other portable devices. WD Scorpio delivers best-in-class performance with low power consumption and cool operation. In addition, you'll get one of the quietest 2.5" drives on the market with real-time data protection technology to help keep your data safe. Massive capacity - Whether they are in an external drive or a notebook computer, WD's 320 GB 2.5" drives offer the most available capacity for space-hungry operating systems like Windows Vista, plus plenty of room left over for photos, music, and video. Fast and Efficient - With 5400 RPM spin speed and 12 ms access time, even the most demanding customer will appreciate the performance achieved by WD Scorpio drives. Quiet - In a notebook drive, silence is golden. WD's exclusive WhisperDrive combines state-of-the-art seeking algorithms to yield one of the quietest 2.5" hard drives on the market. These algorithms also optimize the way a drive seeks for data, which significantly improves power consumption. So now silence (and longer battery life) is golden. PR: Sonnet Technologies, announces the immediate availability of the Sonnet FireWire 800 ExpressCard/34 adapter for MacBook Pro computers and Windows notebook computers with ExpressCard slots. This Sonnet card enhances notebook computers' capabilities by providing support for the fastest FireWire multimedia peripherals through its dual, full-bandwidth ports. Sonnet FireWire 800 ExpressCard/34 provides users the ability to connect additional FireWire 800 (1394b) peripherals, such as external drives and AJA Video Systems' Io HD professional video interface and conversion solution. The Sonnet adapter delivers the maximum data transfer speeds for the fastest multimedia devices, satisfying the high-bandwidth demands of video and pro-audio applications. This card works in ExpressCard/34 and ExpressCard/54 slots, supports all FireWire 800 and FireWire 400 (1394a) devices, and features hot-pluggable and hot-swappable device connection with automatic device configuration. PR: iLugger, a division of LTA Projects, announces their newest addition to their iMac case collection. In response to Apple's release of Mac OS X v10.5 Leopard on October 26, 2007, iLugger has come out with a line of cases just for the occasion. Celebrate the release of Apple's latest OS with a custom made Leopard print iMac iLugger! Same great craftsmanship and exceptional reliability, and more personal style! 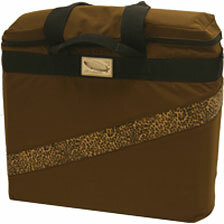 That's what you'll get when you purchase the new custom* 17/20 Inch Brown iMac Carrying Case with Leopard Print. Each 17/20 inch Brown iMac Carrying Case with Leopard Print comes with the same durability and protection as all other iLugger bags. Whether you're traveling around the world or around the corner, you'll receive high endurance and great performance every time, everywhere you go. Moreover, the iMac cases are designed to reduce the risk of tears or rips. While keeping the same great craftsmanship and exceptional reliability that iLugger customers have come to know and trust, these new bags come in brown or black and are equipped with a stylish, leopard-print patch representing the newest Mac operating system. These leopard cases are no kittens either, the iMac cases are created with durable nylon fabric to resist rips, tears and even water so your iMac will be protected in the toughest of conditions. These 17/20 inch iMac cases and are perfect for trips across campus, to and from the office or around the world. PR: miniXpress potable rugged yet stylish cases are made with Aluminum assuring durability, excellent heat dissipation and impact protection, keeping your high RPM SATA hard drive running cool and safe. The drive spin down function ensures efficient operation by automatically reducing power consumption. When the laptop or desktop system enter sleep mode, the miniXpress spins down to minimize power consumption. The hard disk spins up automatically when the host system wakes up. miniXpress customized to give 2.5" SATA HDD users blazing SATA transfer speed and multiple interface connectivity options, the combo miniXpress offers a full spectrum of connectivity options with eSATA, USB 2.0, FireWire 800 and FireWire 400 ports with repeater functionality. The groundbreaking DuoLink eSATA/USB 2-in-1 IO connector (miniXpress 825 S &425 S) combines an eSATA and a USB 2.0 port into a single connector. The discreet, "error-proof" connector eliminates potential damage to the enclosure, by limiting the direction in which the eSATA or USB cable can be inserted. miniXpress potable rugged yet stylish cases are made with Aluminum assuring durability and heat dissipation. Equipped with Anti Shock mechanism and Duale interface (F400/USB) makes miniXpress an ideal, versatile and economical solution for portable external storage. Utilizing the latest Oxford 934DS Hot pluggable and Bus powered technology feature allows the FireWire drives to be Plugged or Unplugged with out turning-off or restarting the computer. The drive mounts automatically when plugged in to the FireWire Port of the computer. PR: Do you think your MacBook (Pro) is running to hot? Give Fan Control a try then. Do you think your MacBook (Pro) is running to hot? Give Fan Control a try then. Some MacBook (Pro) are just to hot for day-long use. Fan Control adjusts the minimum fan speed depending on the current CPU temperature. For safety, it leaves the original automatic fan speed control intact. Fan Control is distributed under the GNU General Public License (GPL). The sources are included in the download. Registered users can also change the frequency and voltage of the processor. The "Santa Rosa" / LED MacBook Pro is only partially supported. Read the manual for more info. Added a larger "Leopard icon". Fixed an issue affecting the activation/deactivation of CoolBook on OS X 10.5. Core Duo MacBook Pro and MacBook. Some support for iMac and Mac mini. For more deals on current or recently discontinued models, see our MacBook deals, 15" MacBook Pro deals, 17" MacBook Pro deals, 12" PowerBook G4 deals, 15" and 17" PowerBook G4 deals, titanium PowerBook G4 deals, iBook G4 deals, PowerBook G3 deals, and iBook G3 deals.